Perhaps the easiest to identify, the Class C motorhome comes with an iconic over cab sleeping area that allows for more living space within the motorhome. Essentially, this class of motorhomes offers a compromise between Class A and Class B motorhomes. Remember? Class A motorhomes are known for being big, luxurious rigs built for long trips and extra comfort. Meanwhile, Class B motorhomes (also known as camper vans) are built for ease and convenience and are much smaller than Class A motorhomes. For those who don’t want the excess of Class A but want more space than a Class B has to offer, then the Class C motorhome is the ideal option. The Class C motorhome is built with a commercial cut-away van chassis. If you’re wondering what a cut-away van chassis looks like, think of the common moving truck. Those trucks have the front of a van but the back half is large storage space. Essentially, Class C motorhomes are like those moving trucks except instead of storage space on the back half, they have an accommodating living space offering plenty of comfortable amenities. How Many People Can Live in One? Class C motorhomes typically accommodate anywhere from 4 to 8 people. It really depends on the size of the motorhome and how efficiently the vehicle’s living spaces were designed. Some motorhomes are ingenious in their designs and are able to fit sleeping areas in hidden spaces. This allows for greater living space during the day which is then transformed into sleeping arrangements at night. These in-between motorhomes are larger than Class B motorhomes and can also be just as large as Class A motorhomes. The primary difference between Class C and Class A motorhomes is that Class B motorhomes are made from a van chassis while Class A motorhomes are made from a commercial bus chassis. Typically, Class C motorhomes can range anywhere from 21 feet long to 35 feet long. 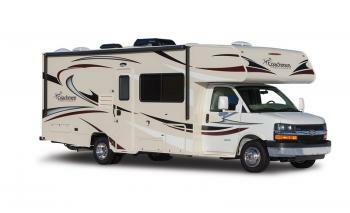 However, the smallest Class C motorhome we offer is the 25-foot beauty pictured above. As said before, the primary, cab-over sleeping area in the front of the motorhome really opens up a lot of space for the living area, kitchen, and for other sleeping areas. Typically, you’ll see a step ladder leading to the cab-over sleeping area in the front of the motorhome. Like the Class A motorhome, Class C motorhomes are ideal for families or large groups who are looking for a long-term road trip or to travel across the country. The motorhomes come in either gas or diesel options and offer better gas mileage than Class A motorhomes but are not as fuel efficient as Class B motorhomes. You can expect 10-15 miles per gallon. For even more space, people with Class C motorhomes are able to tow typically up to 5,000 lbs. This allows you to tow an extra travel trailer if you have one that can offer even more living and sleeping areas. This also means you can tow a personal vehicle behind the motorhome during your travels. Keeping a personal vehicle available during your travels can offer a ton of convenience when you want to head into a small town or city. While Class C motorhomes are usually easier to maneuver than Class A motorhomes, they’re still no match for the convenience of your personal vehicle. You might find that out while trying to fit into a smaller parking space in a crowded parking lot. You can also tow a boat if you’re taking the motorhome to camp out near a lake or large body of water. Whatever the case, the Class C motorhome’s towing ability offers a lot of versatility and extra comfort. The motorhome also offers slide-out options in a similar capacity as Class A motorhomes. These slide-out options offer even more living space, sleeping space, and kitchen space. Most Class C motorhomes offer up to two or even three slide-out options. With multiple slide-outs, you’ll find the motorhome to be plenty accommodating when it comes to space and comfort. If your interest has been piqued about Class C motorhomes but you’d like even more information, please contact one of our RV experts. Any further questions about motorhomes and what they offer you for your next adventure can be answered by us!